A picture of some of the very early tank crewmen - Cyril Coles is fourth from the left on the first row of men dstanding shoulder to shoulder. 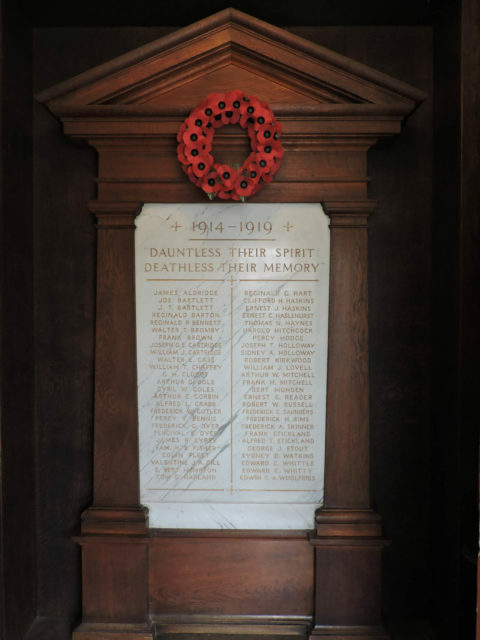 A chance discovery in a church has revealed the identity of one of the first ever tank crewmen to be killed in action. Cyril William Coles engaged the enemy in the first tank attack in history on 15th September 1916 at The Somme. After his tank was hit he climbed out, but straight into the sights of German machine gunners. Cyril Coles – one of the first tank crewmen to be killed – during the first day tanks ever took to the battlefield. The church plaque that was spotted and identified him. The grave of Cyril Coles in France. He was one of the first tank crewmen to be killed in battle. 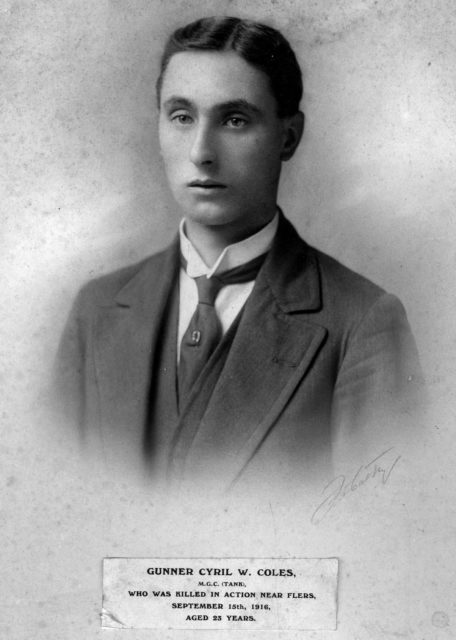 It prompted museum staff to research Coles’ life and they discovered he was born at Canford, Dorset, in 1893. He was the son of a corn miller and was working with his father at Creekmoor Mill in 1911. He was also identified in one of the first group photographs of tank crewman and after further research the museum identified which tank he served in at Flers and what happened to him and the crew. After being killed, his remains were interred next to the disabled tank and following the Armistice they were relocated to the Bull Road cemetery to the east of Flers. His memory was kept alive by his brother Donald Coles who, in 1925, named his only son after Cyril. But staff have been unable to trace the family further and are appealing for any descendants to get in touch. Cyril Coles – one of the first tank crewmen to be killed in history. 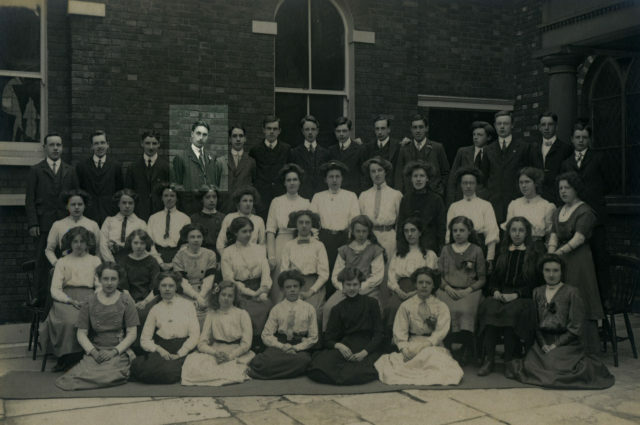 Pictured here at his church in 1912. He’s fourth from the left on the back row. “We knew that a Cyril Coles was killed on the very first day that tanks ever went into battle. But finding such a personal story practically on our doorstep was a complete coincidence. For our centenary exhibition we identified eight of the first tank man, some of whom took part in the first ever action, and Cyril Coles is one of two who didn’t survive the war. 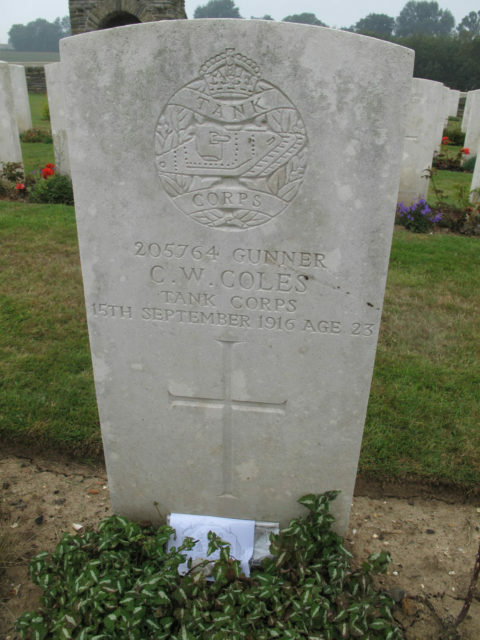 Coles was one of the very first tank crewmen to be killed and 100 years on it would be wonderful to make contact with his family. We’re in touch with the families of several of those who took part, but would love to find the relatives of Cyril, especially as he was local. Cyril Coles named in the church where his death was spotted and prompted the Tank Muesum to investigate. Like so many names on First World War memorials we all pass by without a second thought, Cyril was until recently just another anonymous casualty of a war fought long ago. But now we know he was one of that small group of men who were pioneers of tank warfare and was inside one on the very first day they rolled towards the German trenches. To mark the centenary the museum is taking a replica of a World War One tank – that was made for the film War Horse – to Trafalgar Square on September 15. Cyril Coles undertook just five months of training before travelling to France in August 1916 where he formed one of the eight man crew of tank D15. The centenary event on September 15 is being supported by the World of Tanks publisher and developer Wargaming. All images provided by the author.